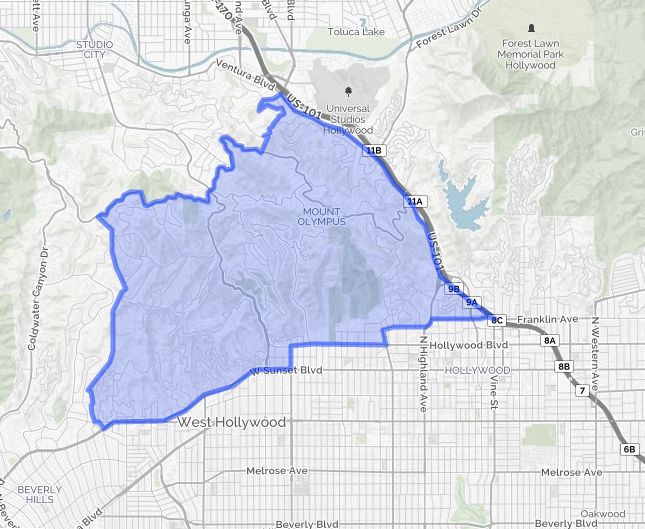 The MLS designated area for the Hollywood Hills West is bounded on the south by Sunset Blvd, on the east by the 101 Freeway, on the west past Laurel Canyon just beyond Wonderland Park Avenue], and on the North on by Mulholland Drive, then down the hill on the Valley side via Fredonia and Lankershim to the 101 Freeway at Universal City. Runyan Canyon Park is the place to go for your taste of nature (and let's not forget the Laurel Canyon Dog Park for Fido). Being home to the most famous Canyon neighborhood, Laurel Canyon, Hollywood Hills West boasts a rich history. While it's counterpart, Hollywood Hills East is home to Mulholland Drive, there is no shortage of rock n roll history here, and Hollywood history there. Falling in love with Hollywood Hills West?